The City of Boston is currently rolling out a $16 million plan to reconstruct a portion of Commonwealth Avenue along Boston University’s campus, widen Massachusetts Bay Transportation Authority Green Line tracks to satisfy federal regulations and narrow sidewalk space for pedestrians and BU students. Phase 1 of the reconstruction efforts, in which BU and the Boston Transportation Department added trees, street furniture and brick crosswalks to Comm. Ave. during summer 2014, received criticism from community transportation organizations like Transit Matters and LivableStreets. Transit Matters contributor Matthew Danish described Phase 1 as being “completely inadequate for handling the volume of pedestrians generated by Boston University in between classes” on their blog. 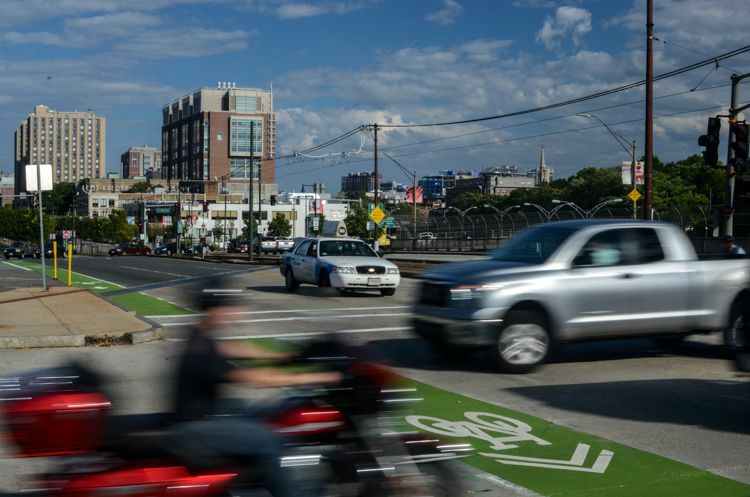 Plans for phase 2A, which will widen MBTA tracks and narrow sidewalks in the area from Armory Street by the Boston University Bridge to Packard’s Corner, will be finalized and sent to federal contractors by fall 2015. Riley said as the city looks forward to completing its plans for reconstruction, students’ safety and security remains BU’s primary concern. “We believe that roadway improvements will only enhance safety, but what will work best is for individuals going through campus or the city to make their personal safety a priority,” he said. College of Engineering junior David Miller, president of the student organization BU Bikes, said the city should address the safety hazard for bikes on that particular stretch of road due to the number of accidents that have occurred on Comm. Ave.
His solution, partly shared by Transit Matters and LivableStreets, is to create a cycle track on Comm. Ave., adding a separated path on the street that runs adjacent to traveling vehicles. Miller said he hopes to raise support and awareness about the cycle track both on campus and within the city, partly through a petition he has drafted with the Boston Cyclists Union. Several residents said they support any plan to ensure the safety of pedestrians. Kate Doppelt, 25, of Fenway, said that in a populated city like Boston and on a street as busy as Comm. Ave., there is always some uneasiness that comes with navigating the streets and sidewalks. College of Arts and Sciences freshman Soubhana Asif said while she supports the reconstruction project, it could cause potential problems for people directly in the area. Drago Takeda, 37, of Jamaica Plain, said he is glad the project addresses the narrow track space for the Green Line because it will provide a larger buffer between operating trains for people waiting to board as well as MBTA workers.